Previewing the Final Four matchup between the Sooners and the Wildcats on Saturday night. Four keys to Saturday’s Final Four clash between the 33–5 Villanova Wildcats, champions of the South region, and the No. 2 Oklahoma Sooners, the West region champs. What more is there to say about Buddy Hield? The Sooners senior has been the biggest star of this season, and especially this postseason. After being held to a season-low six points in Oklahoma’s Big 12 tournament loss to West Virginia on March 11, Hield has been exacting revenge on every opponent in sight. He’s averaging 29.3 points per game, up almost four points over his season scoring average of 25.4, which was the second best in Division I. Importantly, the Sooners have learned how best to play around Hield. When he is feeling it, as he was in the Elite Eight against Oregon—hitting eight of his 13 three-point attempts en route to 37 points—they let the offense flow through him. When his shot isn’t falling quite so consistently, as in the Sweet 16 game against Texas A&M—when he hit six of his 13 field goal attempts—the Sooners’ other Core Four upperclassmen (more on them below) can pick up the slack and pick up a win. Buddy Hield is probably good enough to put a team on his back and win a national title alone. The good news is that Oklahoma won’t need him to. Villanova entered the NCAA tournament as a No. 2 seed but was the No. 5 team on kenpom.com in adjusted efficiency, outpacing No. 1 seed Oregon and every No. 2 save for Michigan State. But the Wildcats also entered the NCAAs with a perception problem. Coach Jay Wright hadn’t guided a team to the second weekend of the tournament since 2009, when the Wildcats reached their fourth Final Four in school history. Consecutive round of 32 upset losses in 2014 (as a No. 2 seed, against No. 7 UConn) and '15 (as a No. 1 seed against No. 8 NC State) made many people doubt Villanova's ability to make a run. Now, those doubts seem silly. Not only have the Wildcats gone on a run, they’ve had arguably the most impressive NCAA tournament of any team in the country. They have faced the highest possible seed in every round—a No. 15 (UNC Asheville), a No. 7 (Iowa), a No. 3 (Miami) and the No. 1 overall seed (Kansas)—and vanquished each of them. No team has scored more than 70 points against Villanova this postseason (which includes the Big East tournament), and the Wildcats held the Jayhawks, the fourth-best three-point shooting team in the country this season, to 22.2% shooting in their most recent outing. Villanova is convinced that its defense is the difference this season, and so far that's been proven right. The Wildcats will face their toughest test, though, in trying to slow Hield on Saturday. Or none should be. 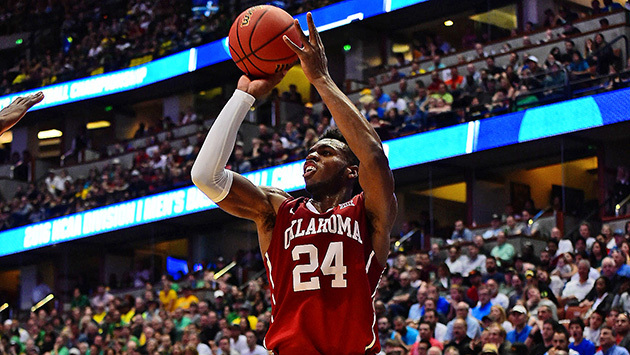 The Sooners’ top freshman, forward Dante Buford, averages 3.6 points in 12.4 minutes per game. The Wildcats do give significant minutes to a freshman, 6’3” guard Jalen Brunson (son of former NBA player Rick Brunson), but he averaged just 9.8 points and 2.6 assists per game. He has the skills of a future NBA player—if not the size—but could use another few years of development. No, this game won’t be decided by freshmen, it will be in the hands of upperclassmen who have matured for three or four years at their programs. Oklahoma relies on its Core Four—seniors Hield, Isaiah Cousins and Ryan Spangler and junior Jordan Woodard—who will be starting their 105th consecutive game together on Saturday. On the other side, Villanova is led by senior guard Ryan Arcidiacono up high and 7-foot senior center Daniel Ochefu down low. Juniors Josh Hart and Kris Jenkins and sophomore Phil Booth round out the starting five. No player on either team has Final Four experience, but the familiarity each lineup has with one another should mitigate any nerves they might feel by being on the biggest stage in the sport. On Dec. 7, Oklahoma defeated Villanova by that mark on a neutral site, at the Pearl Harbor Classic in Honolulu. The Sooners won that one despite a subpar performance from Hield, who finished the game with 18 points on 17 shots and had no assists but two turnovers. Cousins was the star of that game, scoring 19 points, dishing out 10 assists and collecting six rebounds. Oklahoma's defense also clamped down against the ‘Cats, holding them to a dismal 12.5% shooting (4 of 32) on three-pointers during the game. Five Sooners ended the game with offensive ratings north of 110; no Wildcat cleared 105. For Villanova, the most lopsided loss of its season (the other four—to NCAA tournament participants Virginia, Providence, Xavier and Seton Hall—came by a combined 26 points) should provide sufficient motivation. Wright can once again tell his group that no one believes in them and no one expects them to win. For Oklahoma, Lon Kruger’s speech should be even easier: You’ve beaten this team—badly. Go out and do it again. The Wildcats have earned their way to a shot at revenge with the Sooners by playing their best basketball of the season. By the time Saturday night’s tilt tips off, that December win will be nothing more than a footnote.